Give Me My Remote > The Office > Jim Halpert > Jim Halpert…Did He or Didn’t He? Jim Halpert…Did He or Didn’t He? 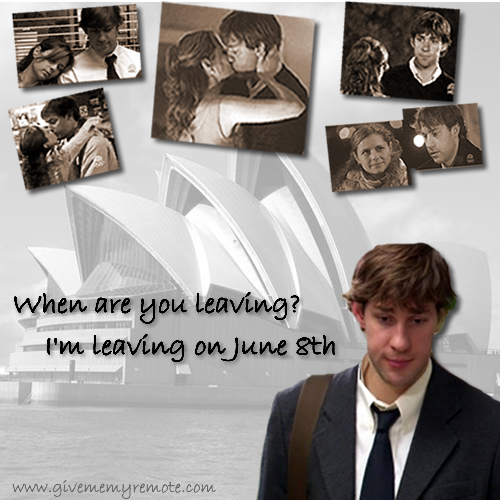 Last April, Jim Halpert booked a trip to Austrailia scheduled to leave on June 8th…just two days before the love of his life, Pam Beesly was supposed to get married. We know Pam didn’t tie the knot, but did Jim go on his trip? Hmmm. Well there you have it. No need to worry about that mystery anymore. And stop looking for a little stuffed koala on Pam’s desk – you ain’t going to see one. And I guess Rayn was right. Haha! Ryan should be a betting man I suppose after all. Also, I just noticed now: a second deleted scene for Grief Councelling is up on NBC. I love these things!!!! Ohhh, that’s cool. I can’t believe you find all this stuff! Thanks! And that was one of the coolest scenes, how Jim said the, “I’m leavin’ June 8th.” That was amazing. Awwwww…. It really would have been nice for Jim to get away on a trip to Australia. Oh well, better luck next time, i guess. Thanks for the info, GMMR! Aww, poor Jim. I think he would have liked Australia. He could have donated that non-refundable ticket to me. I would have been happy to take a solo Australian vacation. I am surprised they just dropped this. What was the point of having a whole episode about it, then? Just to reinforce the fact that Jim doesn’t deviate from his routine, and that he had a fun-filled weekend in Philadelphia? Couldn’t they have found SOME use for the vacation thing, even if just, as Paul mentioned, a good joke? Even beyond that, it could have been used for character development, surprise plotlines, etc…How disappointing. Thanks for asking Paul, Becky! Here’s my two cents on how this could have played out on the show…. Pam and Jim start talking and catching up on the time they’ve missed. She asks him how Austrailia was. He stammers and tries to explain that with the transfer he decided it was not the best time time to go. Pam knows that she was to blame for the transfer and feels partly responsible for Jim not making his trip. But then she comes to realize that Jim maybe found out that she called off the wedding, and he opted not to go to Austrailia in hopes of Pam calling to tell him that she loved him too. She never did…he transferred….lost out on the non-transferable ticket. I too was kind of bummed that the storyline was just dropped. “UNLESS”.. Sounds like Paul left a rather sizable loophole there. I’ve always thought it was all a big fat lie by Jim. He never booked it. We didn’t see him do it, only talking about it. To Pam, whom he’s lying to. Hmmm. You have some good theories. I wish Paul would have given me some more info, but I was just thrilled that he wrote me back. I like your idea, GMMR. I think there is alot of potential regarding this whole Australia thing, whether Jim went or not. I guess we’ll find out eventually. P.S. Im dying for this Thursday to come! It would be cool if they (the writers) did a little talking head about it. in the words of Micheal, lose-lose. Not pretty.